(2000) "Geto Heaven Remix T.S.O.I. (The Sound of Illadelph)"
(2001) "Geto Heaven Remix T.S.O.I. (The Sound of Illadelph)"
"Geto Heaven Remix T.S.O.I. (The Sound of Illadelph)" is the third single from rapper Common's 2000 album Like Water for Chocolate. It features Macy Gray and was produced by Questlove and James Poyser, both of whom are members of the Soulquarians. Its title is a reference to MFSB's 1974 "TSOP (The Sound of Philadelphia)"; it contains positive lyrics that are pro-woman and slightly religious. It is featured on the alternate release of Like Water for Chocolate, but on the original pressing, a song named "Geto Heaven Part 2" is found instead. "Geto Heaven Part 2" features D'Angelo and was originally intended to be on the latter's 2000 album Voodoo. The remix reached number sixty-one on the Hot R&B/Hip-Hop Songs chart, while the D'Angelo-featured version did not chart. A music video directed by Nzingha Stewart was made for the remix. ↑ DeRogatis, Jim (February 5, 2006). "Just plain Common sense". JimDero.com. Retrieved 2007-04-28. ↑ Thompson, Ahmir. "D'Angelo – Voodoo". Okayplayer. Archived from the original on 2007-09-28. Retrieved 2007-04-28. 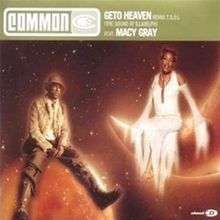 ↑ "Chart Stats – Common Featuring Macy Gray – Geto Heaven". Chart Stats. Retrieved 2008-03-21. ↑ "Chart Data: Common". Mariah-Charts.com. Retrieved 2008-03-21. ↑ "Hot R&B/Hip-Hop Songs". Billboard. Archived from the original on January 12, 2014. Retrieved 2008-03-21.